It's All Happening at Snow Farm in June! Opie and I recently came back from closing on our loft (major YAY!) - sadly we only stayed for a week this time, but while we were there, my close friend Gail told me her daughter-in law Nissa is teaching a workshop at Snow Farm in MA in June. Nissa's work is nothing short of breath-taking! 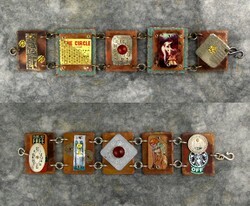 Nissa Kubly teaches a Week-long In- Depth Workshop: Etching on Metal. Tuition packages start at $540. In this information packed workshop you will learn how to transfer designs from printed material or personal imagery to metal surfaces with mylar transfers. Create texture, re-create a favorite pattern or commemorate a special event on non-ferrous metals. Students will learn the tricks of the etching process and gather resources on materials you need to work with etching beyond the workshop. Individual attention and assistance will be given to help complete small projects in this week-long intensive class. Nissa Kubly has a MFA in Metals & Jewelry from Arizona State University and a BS in Art from University of Wisconsin- Madison. She also has a Teaching Certificate in Art and has been creating and teaching art to students of all ages. Since graduate school, Ms Kubly has been constructing and using her own handmade pinhole cameras in metal. Her work has been recognized through grants from 3M Corporation and Phoenix Art Museum and published in Design & Architecture, Pinhole Journal and New York Arts magazine . Nissa's work is exhibited by the Lisa Sette Gallery in Scottsdale, AZ and is part of permanent art collections across the country. 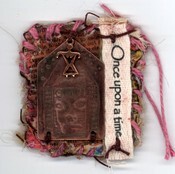 visit her website www.nissakubly.com to see more of her work and attend this workshop if possible! what a fantastic venue this was. portland is a great city. very artsy and very "green". we fell in love with it! our classes were a huge success and here's a few examples of student's work. but glenny brought our bartender Clifford into class with his accordion. he played a song as opie and glenny did a dance (wish I had that picture) then opie heated things up (sans torch) with his rendition of "Lady of Spain". it was wild! a visit to Powells book store was nirvana and the icing on the cake! we can't wait to go back again next year. hope you can join us. What a fantastic time we had. It's such a great venue where we get to spend time with old friends and are given the opportunity to make new ones. The drive to Hampton is scenic and life is beautiful. Our classes were an endless stream of creative energy and here are some pics of our student's work. well i think that's it for now. everytime i upload a picture, i get and error message to stop running scripts or my computer will become unresponsive. while i'm not sure what that even means, if somehow feels as if it's time to stop... for now! we hope to meet many more of you at Art & Soul Portland in sept./oct. where we're offering some exciting new classes in addition to a few of our tried and true favs. what an exciting month this has been. Artfest was fantastic and our students out did themselves again. in addition, we've been featured in two Etsy Treasury's this week. 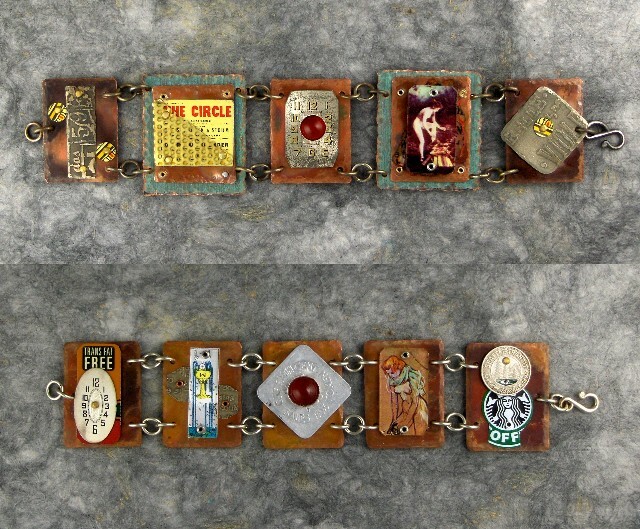 one of our jewelry classes was called Set in Stone which combined metal sheet with concrete. the results were nothing short of fantastic. take a peek! there you have it, although these are only a very few examples in the interest of space. all of the work was amazing and we'll be teaching two of these classes at Art & Soul Hampton, Va. at the end of the month. Set in Stone and Who's Your Dada. hope to get another post in before we leave - lots of prep work to do. A year ago this week a close friend of ours died from cancer. more friends, leaving Opie and me with a void in our hearts. Each of them died before their time. When we were invited to create a charm for this most worthy cause, we were more than happy to. This charm has been etched with positive affirmations and wrapped with teal sinew. A spiral, which represents Eternity, completes it. My father died of cancer when I was five. He was in his 30's. 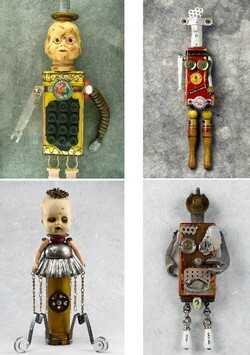 An incredible doll is being created from hand made charms and altered ties created by several artists, too numerous to mention in this post. 100% of the profit will go to the OCRF, in support of their mission to help ovarian cancer patients and their loved ones. For more information about the doll and the project, please click on The Ties That Bind link in the right sidebar. Between this ungodly weather and preparing for our classes at Artfest at the end of the month, opie and i haven't come up for air. we've been making class kits non-stop for the last two weeks and there's plenty more to go. All of the handouts, resource information and paperwork are nicely sorted and packed. we've cut and sanded 30 wood substrates for our DADA class , as the focus on this particular class is working with wood substrates, dowels, altered heads and more. here's a sample of a few of them. We've etched endless nickel silver panels for both our flat to stacked bracelet class which focuses on patination using a torch, riveting layers of metal together as well as riveting through acrylic and working with bezels and cabochons. the results are always so cool and the level of diversity always amazes us, since everyone starts out with pretty much the same basic supplies. our last class on saturday is called fe fi faux and then some, because it transforms ordinary materials into more than the sum of their parts. 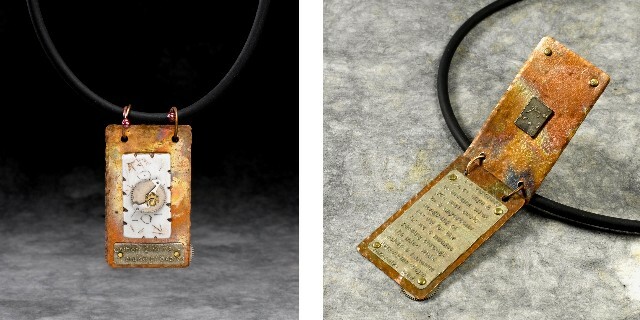 it's a pendant-book class which begins with a very cool water torch patina that sort of looks like old gold. as you've probably figured out by now, we love using the torch - which is evident in our studio name... LOL! In this class we will etch a panel of nickel silver to demonstrate the process of blue-paper etching but being as involved as it is and because there would be so much etchant to dispose of, pre-etched panels will be included in every student kit. this class will also focus on a relatively new PVC material called faux bone, which was developed by the talented and very funny, robert dancik, teacher and all-around excellent person. drawn bead copper jumprings will finish the piece once everything is riveted together. i think this is a great class for making pin rivets, because there really is no end as to how many layers can actually be riveted together. through the wonders of blogging, we discovered this project to help fight breast cancer. recently, our forever friend christine, lost her eight year battle with it. she was a unique, strong, free-spirited woman, with a heart as large as the universe. she and i were one month to the day apart in age. we didn't get to say goodbye. her memorial service and birthday party was celebrated jan. 19th, but opie and i were teaching in mexico and couldn't be there, leaving us saddened beyond words. while i've always described myself as "the sewing impaired", monica magness, gave me the encouragement to try. Happy Birthday Chris...we miss you. Lisa Oceandreamer of Heart of the Nest and Imagination Cafe is hosting the 2nd annual ONE World-ONE Heart Event, starting Feb.1 and ending late night on Feb.13, with the winners of the artworks being announced on Feb. 14.
we have decided to join the One World-One Heart blog give-away, designed to bring bloggers together and introduce them to each other and expand our blogging world. we love this idea and while we're still finding our way as to how to put up links, buttons and badges, we'll give it our best shot. everybody participating is giving away something. all you have to DO is visit the participating blogs and leave a comment - that way you will go into the draw to win that particular piece of art! If you would like to participate in this give-away, leave a comment with your name and blog address and tell us that you would like to enter the give-away. Make sure we can contact you either at your blog or email. we will draw from the names and select a winner before 8 p.m.. February 14 Eastern Standard Time. we will post who the winner is and send off one of these beautiful hand made tin nicho angel brooches, complete with sterling silver bezel and cabochon, from our tin nicho series, but yours will have a special brass heart dangle to commemorate Valentine's Day. Good luck and don't forget to leave a comment here if you'd like a chance to receive a tin nicho angel brooch!